Abstract: Exhaust gas recirculation (EGR) is an effective strategy to control NOx emissions from diesel engines. NOx emissions may be further reduced by cooling of the EGR stream. Drawbacks of EGR include increased PM emissions and increased fuel consumption. Before the commercial adoption of EGR in North American heavy-duty diesel engines in 2002/2004, a number of investigations were carried out to study the feasibility of this technology. 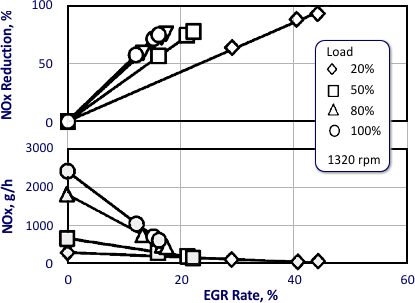 The effect of EGR rate on NOx reduction at various engine loads at a mid-speed condition is illustrated in Figure 1. Under all loads, the amount of NOx decreases as the EGR rate increases. The graph also shows that the NOx reduction effect at a given EGR rate increases as the engine load becomes higher  . This load dependence can largely be explain by the different exhaust gas compositions and thus differences in the dilution effect at the different loads. 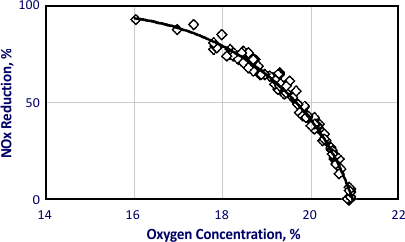 When the NOx reduction for different loads is plotted against intake manifold oxygen (Figure 2), all points fall on the same curve. This means that a given NOx reduction will require less EGR at high loads than at low loads. The temperature of the EGR can impact the intake mixture temperature and therefore NOx emissions. Cooling EGR would increase the temperature differential term in the heat absorption equation for EGR, Equation (1), increase the heat absorbing capacity and further reduce NOx. ΔT - difference between combustion temperature and EGR temparature.